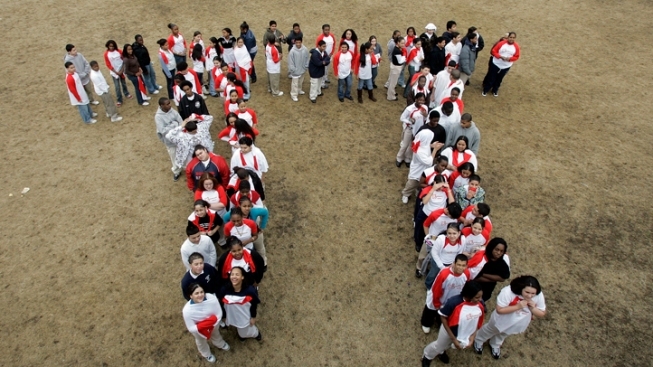 Students from the Maurice J. Tobin School makes a human Pi symbol at the school in Boston, Tuesday, March, 13, 2007, during a celebration of Pi Day. Pi Day is an unofficial holiday in the math community, observed each year on the 14th day of the third month. Thursday is Pi Day, and it is a celebration of the number Pi (or π) — the ratio of a circle's circumference to its diameter, which is equal to approximately 3.14159. It's also a day to gorge on pie. And if that isn't enough, it's also Albert Einstein's birthday. So why celebrate on Thursday, March 14? Because 3.14 is the shorthand version of this number, which PiDay.org describes as an "irrational and transcendental number" whose decimals "continue infinitely without repetition or pattern." Microsoft wants customers to have a Happy Pi Day by enjoying a 3.14 percent discount on the Dell Latitude 10 tablet. The Pie Truck in Washington, D.C. is celebrating with $3.14 pies for happy hour from 5-7 p.m., while Chicago's First Slice Pie Cafe is giving out free slices of pizza at 3:14 p.m. San Franciscans can participate a long day of events sponsored by the Exploratorium that includes a parade, arts and crafts and of course, pie. Incidentally, Pi Day was founded by Exploritorium physicist Larry Shaw 25 years ago. From Pi ice cube trays to Pi artwork, there is plenty of Pi swag on Etsy.com and Amazon to get would-be fans into the holiday spirit. Those with romantic aspirations can buy a .0314-carat diamond ring from Japanese jewelry retailer Brilliance, which is also celebrating Japan's White Day, where men reciprocate gifts received on Valentine's Day. And finally, a DVD of "Life of Pi," which was released on March 12, can cap off a day of Pi and pie celebrations. Or, as an alternative, here is a cool video about Pi.